The Command Module splashes down after a perilous space flight. 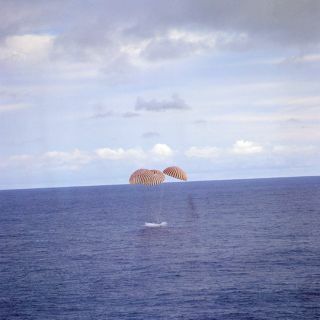 In this historical photo from the U.S. space agency, a perilous space flight comes to a smooth ending with the safe splashdown of the Apollo 13 Command Module (CM) in the south Pacific Ocean, only four miles from the prime recovery ship, the U.S.S. Iwo Jima. The Command Module "Odyssey" with Commander, James A. Lovell Jr., Command Module pilot, John L. Swigert Jr. and Lunar Module pilot Fred W. Haise Jr. splashed down at 12:07:44 p.m. (CST), Apr. 17, 1970. The crew men were transported by helicopter from the immediate recovery area to the U.S.S. Iwo Jima.